Leveraging on the support of our dexterous workforce, we are able to manufacture and supply a wide range of Horizontal Peeler Centrifuge Machines. The offered machines are known for Anti stick coatings on discharge chute, Hydraulic clamping ring for outer body and Cake monitoring system. To ensure that our offered peeler machine bear these features, we make use of premium quality raw material, sourced from vendors of high repute in the manufacturing process. Avail from us a wide range of Horizontal Peeler Centrifuge Machines, which is a batch type automatic and semi automatic filtering centrifuge. The offered machines are suitable for the purpose of clean room installation- “through the wall” by the aid of flexible membrane in accordance with the requirement of the pharmaceutical industry. 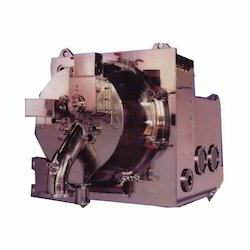 Looking for Horizontal Peeler Centrifuge Machines ?